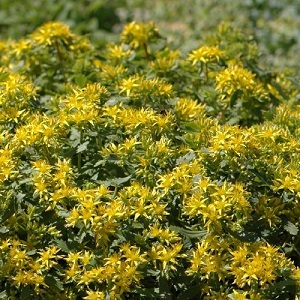 A low growing succulent with a profusion of golden-yellow flowers from May to August. Plants grow to a height of about 15cm and form a creeping mat of scalloped green leaves. Leaves turn an attractive red/orange in autumn. These plants are good for a wide range of places in the garden including rockeries and gravel gardens, containers, as ground cover for hot sites with poor soils, and as green roofs. They look good in drifts and groups. This Sedum prefers a warm sunny spot and well-drained soil. Plants tolerate drought and part shade. They attract bees when in flower. 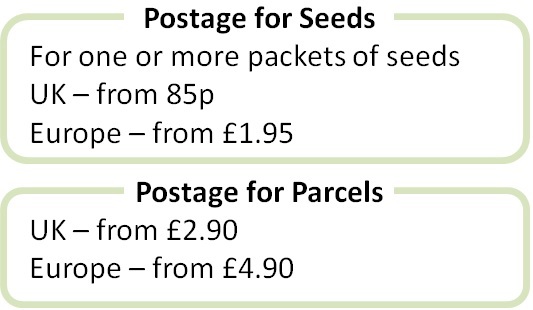 Pack of approx 200 small seeds. Sow anytime, typically spring to autumn. Sowing instructions and a colour photo are printed on the packet. Sow Sow anytime, typically spring to autumn in a tray of moist seed compost. Mix these small seeds in sand and spread evenly over the top of the compost. Or press the seeds lightly into the surface of the compost. Do not exclude light. Keep at about 20°C. Germination takes 2-4 weeks and can be erratic. Pot on when seedlings are big enough to handle and plant into the garden when frost free. Grow Plants grow quickly into an evergreen mat which needs little maintenance. They can be cutback (or mown) in early spring (at least two months before flowering) to encourage strong plants. Mature plants are easily divided in spring or autumn.